The Sixth Judicial District Commission on Judicial Performance unanimously (10-0) recommends that Judge Jeffrey Raymond Wilson BE RETAINED. 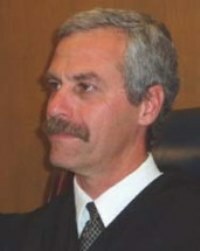 Judge Wilson was appointed to the District Court for the Sixth Judicial District in 2002. He earned a Bachelor of Arts degree in 1977 and a Juris Doctorate Degree in 1980, both from the University of Iowa. He was in private practice for one year. He was a prosecutor in the District Attorney’s Office in Colorado’s Fourth Judicial District from 1981 – 1983, in the Sixth Judicial District from 1984 to 1989, and in the Twenty-Second Judicial District from 1989 to 1990. In 1990, Judge Wilson returned to private practice. His practice focused on personal injury, criminal defense, dependency and neglect, and family law. Judge Wilson was also the Southern Ute Tribe Prosecutor from 1996-1998 and a Southern Ute Tribal Judge pro tem in 2001. The commission reviewed comments from the public and analyzed survey responses from attorneys and non-attorneys who had appeared in his court. The Commission members observed him in court, reviewed decisions he authored, reviewed his self-evaluation, met with representatives from the Public Defender’s and District Attorney’s Offices, and conducted a personal interview with Judge Wilson. Among the survey questions was “how strongly do you recommend that Judge Wilson be retailed in office, or not be retained in office?” Of attorneys completing the survey, 86% recommended Judge Wilson be retained, and 15% recommended that he not be retained. (The percentages do not equal 100% due to rounding). Of non-attorneys completing the survey, 85% recommended Judge Wilson be retained in office, 9% recommended that he not be retained, and 6% made no recommendation regarding retention. Judge Wilson presides over criminal, domestic, juvenile, dependency and neglect, and civil matters in his court. Judge Wilson received an overall combined average rating in the survey results from attorneys which was equal to all District Judges standing for retention this election and from non-attorneys, above the average combined rating of all District Judges standing for retention this election. These ratings reflect comments received and the conclusions by the Commissioners that Judge Wilson has taken positive steps toward improvement in performance in areas needing his attention as addressed in previous evaluations, especially with regard to several aspects of appropriate judicial temperament and communications skills with participants in the Judicial system. Judge Wilson is aware of the continuing need to be sensitive to these areas of judicial performance. In the recent evaluations, and in the Commission’s assessment, Judge Wilson is correctly described as dedicated, hard-working and efficient, and a well-prepared and fair trial Judge.